The DB12121PE is a pilot-operated, spring-loaded spool valve with a pilot drain at port 3. 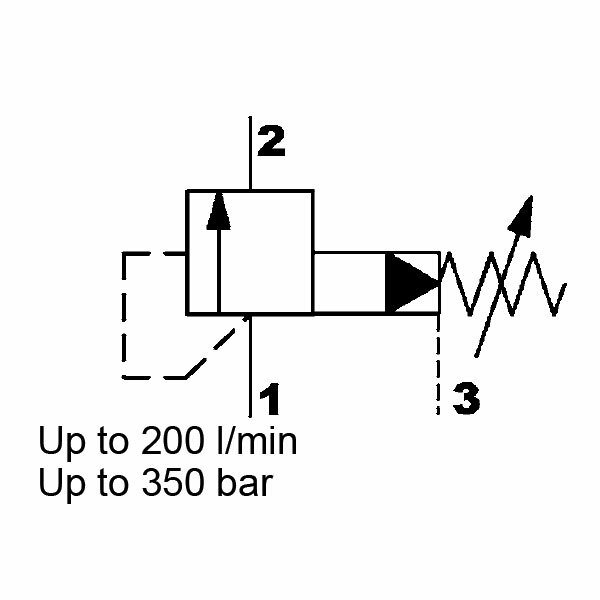 This means that any pressure at port 2 has no influence on pressure adjustment. Therefore, if the pressure at port 1 exceeds the preset spring tension, the pilot-stage opens. The oil will flow from behind the main spool to tank port 3. Therefore, the resulting pressure differential causes the main spool to move against the reset-spring. This movement will allow the oil to flow from port 1 to port 2.